Two Arabs were reportedly hurt by IDF fire in the Khan Younes area. Two Arabs were reportedly hurt by IDF fire Friday in the Khan Younes area, after Arabs began rioting along the border fence with Israel. Last Friday, dozens of rioters vandalized and ignited fires on the Arab side of the Kerem Shalom humanitarian crossing in Gaza. The IDF said that the rioters damaged gas pipelines that run from Israel to Gaza and benefit Gazan residents. “This is the second time in recent days that rioters have harmed and attempted to sabotage humanitarian efforts that Israel and other countries carry out. Hamas is responsible for everything that happens in Gaza, above and below ground,” said the IDF Spokesperson’s Unit. 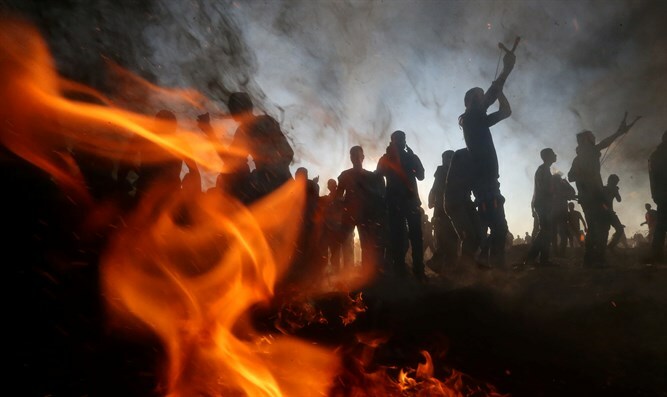 Earlier last Friday, approximately 15,000 Palestinian Arabs participated in riots along the Gaza border. The rioters hurled pipe bombs, rocks, and grenades, sabotaged security infrastructure, and burned tires.